Jake Connor to be honored with graduating seniors. 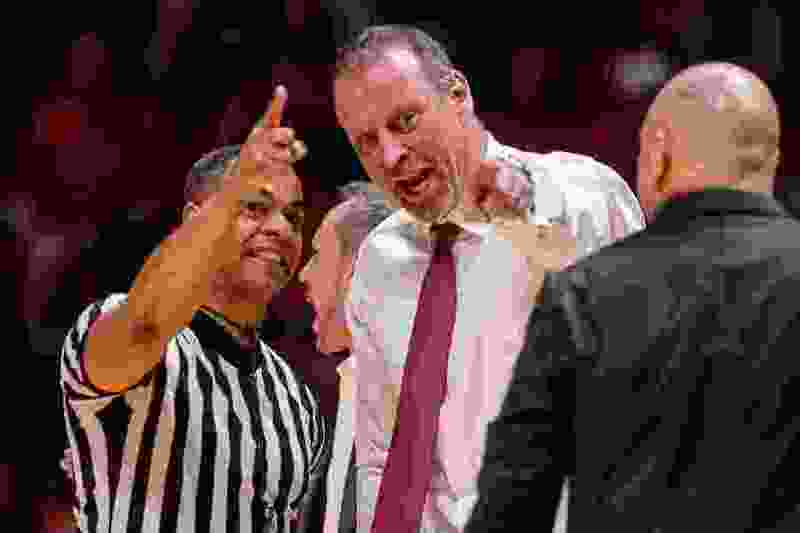 (Trent Nelson | The Salt Lake Tribune) Utah coach Larry Krystkowiak argues with an official as the University of Utah hosts USC, NCAA basketball at the Huntsman Center in Salt Lake City, Saturday, Feb. 24, 2018. Perhaps the Pac-12 schedule breaks in the Utes’ favor this week. At least that’s the hope for men’s basketball coach Larry Krystkowiak. Utah (18-10, 10-7) will play just one game in the final week of Pac-12 play, and the Utes wrap up at home Saturday against Colorado (16-13, 8-9). The Utes will have had six days off since their last game against USC when they host Colorado. The extra days off this week could factor into the availability of junior guard Sedrick Barefield and sophomore center Jayce Johnson. Krystkowiak didn’t indicate whether Barefield is expected to be back Saturday. Johnson, the team’s second-leading rebounder (5.5 per game), played just 10 minutes in the past two games due to a foot injury. Barefield, the third-leading scorer (11.2 points per game) and one of two primary ball handlers, did not play against UCLA or USC last week. The Utes hope they return to health so they can carry some momentum into the Pac-12 Tournament. “It’s no different than a golfer when he wins a golf tournament or something,” Krystkowiak said. “If you’re spraying the ball all over the place and struggling in certain areas, there ain’t going to be much momentum in the next round. The Utes will honor five graduating seniors before Saturday’s final home game. Gabe Bealer, Justin Bibbins, David Collette and Tyler Rawson all are in their final seasons with the Utes. Jake Connor, who has another season of eligibility remaining because he redshirted in 2014-15, also will be honored on Senior Day. Connor, a captain, is the son of associate head coach and former Utes point guard Tommy Connor. Women’s basketball players Megan Huff, Emily Potter and Tori Williams all were recognized by the Pac-12 as part of the annual season-ending honors Tuesday. Huff, a junior forward, was one of 15 players who earned spots on the all-conference team. She led the Utes in scoring (14.5 points per game) and rebounding (7.9 per game) during the regular season. Potter, a senior forward, earned both all-conference honorable mention and honorable mention on the all-defensive team. She led the team in blocked shots (1.8 per game) and ranked third in scoring (12.6 ppg) and second in rebounding (7.6 per game). Williams, a freshman guard, averaged 9.0 points and 2.2 assists per game while shooting 36 percent on 3-pointers to earn honorable mention on the all-freshman team.